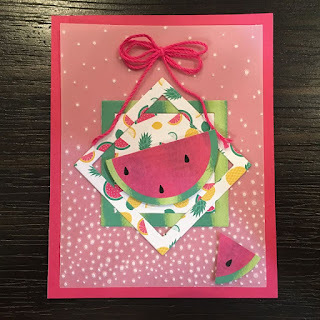 Christi's Creative Crew: Paper Pumpkin & So Much More!! NO??? Do you know what you are missing?? Each month you receive a wonderful box of surprises. This kit is all inclusive with everything that you need to make the cards or projects that come in the kit. This is an example of the gift bag, tag (with cutest little clothes pins to attach it to your bags) and tissue paper. This tissue paper is also top quality, not that flimsy stuff we settle for at our local dollar store and it has little black watermelon seeds on it. I found some watermelon shaped candies to add to the bag and I gifted it to the hostess at the picnic that we went to yesterday. Now, let me get this straight... you do NOT need to craft within the lines!! One of the most fun things about subscribing to Paper Pumpkin is coming up with alternate ideas. 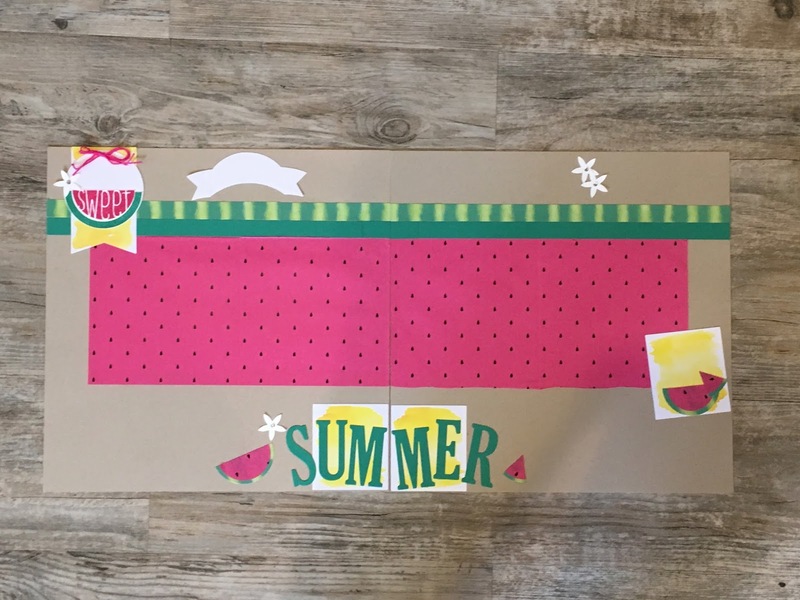 I saw this fun card fold and thought I would give it a try using the June 2017 Paper Pumpkin kit. I had some elements left over from the previous card so combined them to make this card. I embossed a 4" x 5.25" piece of Vellum card stock using the SOFTLY FALLING embossing folder to give the card dimension. 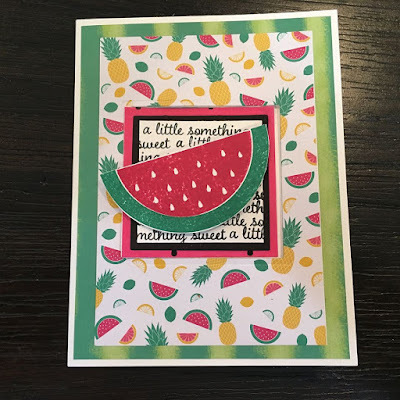 I was playing with the POCKETFUL of SUNSHINE stamp set and coordinating thinlits dies and thought the darling fruity note card (that comes in the kit) would make a cute pocket purse. I even found some healthier-for-you fruit snacks to go inside. After I cut out the pocket from the note card I ended up with a 1.5" strip so I made the ends into a banner and turned it into a magnetic bookmark. 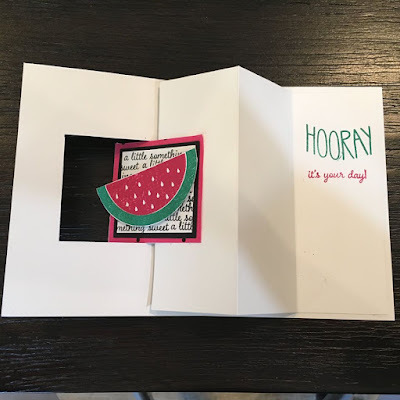 It snaps right over the card front so that your card is also a gift! I used the OH MY STARS! 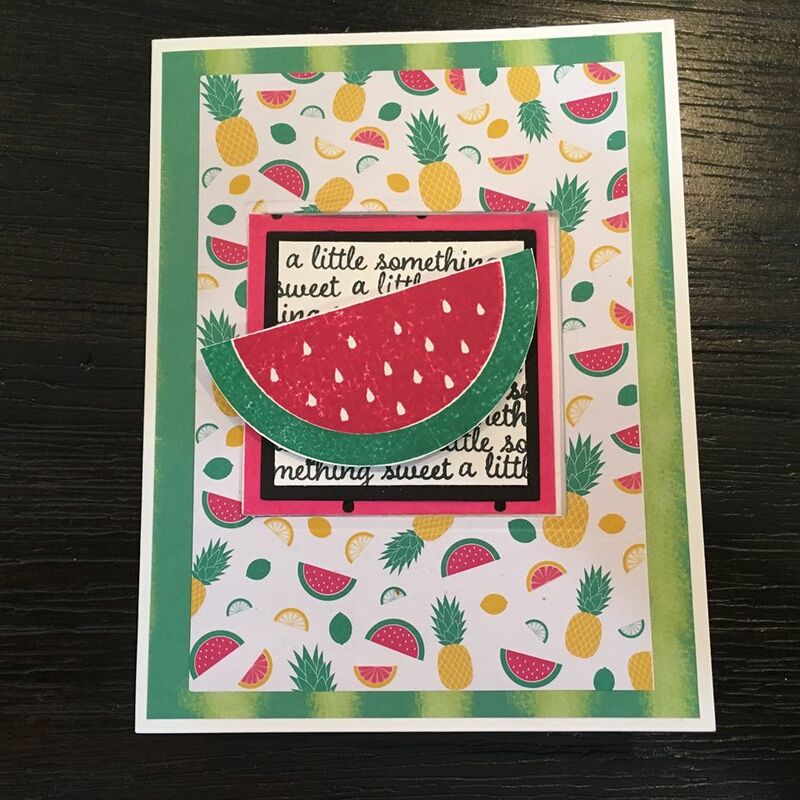 embossing folder and then stamped images from LABEL ME PRETTY and POP OF PARADISE Stamp Sets. The "Hooray" Stamp, banner and the leaf are included in the kit. On this one I stamped the watermelon using the stamp provided in the kit and cut one down for a wedge. This next box was inspired by Rachel Tessman. She showed some of these sweet fruit slice candies on her blog so, of course, I had to find some of them as well. I had some Lemon Lime Twist colored tissue paper on hand and it went perfectly with this treat box that will also be a gift for someone special. Last, but not least, I made a scrapbook page that was inspired by Janet Holmes on the Paper Pumpkin Fan Club Facebook Page. What? there's a Paper Pumpkin Fan Club??!! 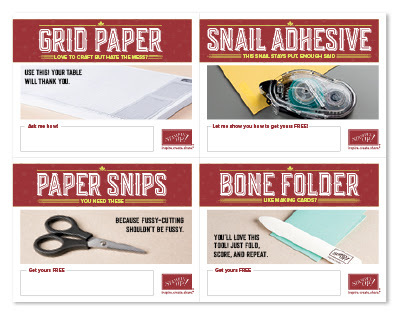 you betcha - started by Rachel Tessman we now have a TON of ideas from a multitude of Paper Pumpkin subscribers. If you are like me you don't feel confident in coming up with your own alternative ideas, just subscribe to the Paper Pumpkin Fan Club Facebook page and you will have a TON of ideas at your fingertips. 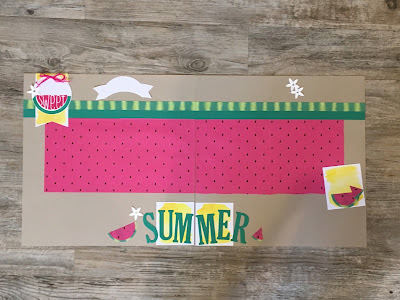 I can't wait to add some fun Summer time photos to this scrapbook page. Could there be anything better?? oh, yeah!! On the third Thursday of each month I hold a FREE Paper Pumpkin night where we bring our kits and work on them, bouncing ideas between us and coming up with great ideas. Best yet, though, is we have fun just being together. And did you know that you can shop with me 24/7? Why, of course!! Just click HERE to get started! 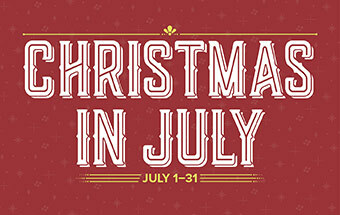 Look at all the extras that you get when you purchase the starter kit in July! Your kit will also include the CAROLS of CHRISTMAS stamp set that hasn't even been released yet. Click HERE to purchase the Starter Kit for only $99.00 and get $125.00 of product PLUS the ESSENTIALS GIFT PACK worth an extra $72.00 - Can't beat that!! Plus you get to be a part of Christi's Creative Crew!! We would love to have you as a part of our team. You do NOT need to do anything after you purchase the Starter Kit, but once you realize you can get a discount on the stuff you are going to buy anyway, you might just want to stick around.